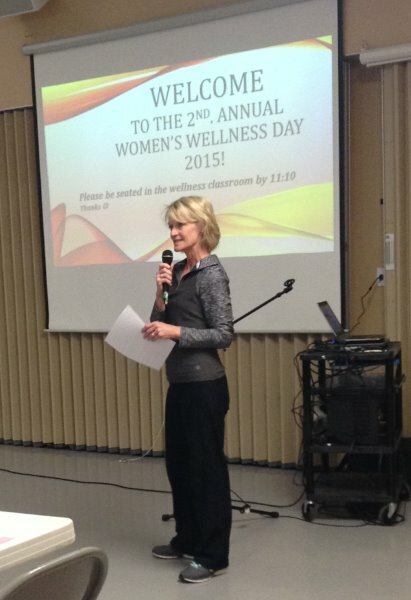 HWM student Kris Greener presents at Women’s Wellness Day, a community wellness event she organizes for her community. The University of Wisconsin Health and Wellness Management program was created for people like Kris Greener. As a busy physical therapist assistant with a family, she never had time to complete her bachelor’s degree. She also had trouble finding the right degree to complement her experience and passion for wellness. Then she found the UW Bachelor of Science in Health and Wellness Management. Currently, she is a student in the program—and loves it! We wanted to ask Kris more about why she chose the program, her experience as a student, and her dream of promoting community wellness programs. Here are her answers, in her own words. I am a full-time, non-traditional student (at age 50!) in the UW Health and Wellness Management program. I am married with two daughters—one is 21 and the other is 15. My oldest daughter and I started college at the same time, in the fall of 2013, which was challenging and entertaining at the same time. I am a physical therapist assistant (PTA) and graduated with an associate degree in 1998 from Western Technical College in La Crosse, Wisconsin. I have been practicing as a PTA for 17 years. I am also an adjunct instructor in the PTA program at our local technical college. I am passionate about health and community wellness. As a hobby, I research health topics and eagerly share what I learn with anyone who will listen, so they, too, can make informed decisions about their health and well-being. I integrate what I learn with my family and the choices we make. I love taking long, brisk walks to reduce stress and rejuvenate my mind, and we have a big vegetable garden that I enjoy. I can and freeze the produce in the fall. Download a four-page overview of the UW Health and Wellness Management bachelor’s or master’s degree program, including information on courses, careers, and tuition. I have always wanted to go back and get my bachelor’s degree. Over the years, I took courses here and there, but it was never a good time to jump into a program full time until now. I felt that I was at a standstill in my career and wanted to grow. I needed a degree program that would expand my knowledge, allow me to pursue a different career, and complement my past experience as a PTA. My goal is to be a health and wellness professional who promotes individual and community health and well-being. I’d like to either work for an organization or start my own business. I have some experience in this kind of work. For the past two years, I have organized and presented at Women’s Wellness Day for my community and am currently working on a presentation for the third annual Women’s Wellness Day. Why did you choose the UW Health and Wellness Management program? I am so glad I found this program. I was looking for something that would complement my degree and experience as a PTA and give me the opportunity to work in a field I was passionate about. The UW Health and Wellness Management program curriculum promotes a healthy lifestyle, physical activity, and prevention. It was exactly what I wanted. I also was looking for an online program. As a busy wife and mother, I wanted to go to school—without having to go to campus—and still be able to take care of things at home. This program allowed me to do that. Describe your experience as a student. Overall, it has been great. I have a good support system at home and my adviser Faye Perkins is always there for me when I am having a tough day. With everything in life, you have challenges, and if you work hard, they become triumphs. Being a full-time student has kept me very busy, so I really need to manage my time well between school and family—both need my attention. What are the most beneficial aspects of the program? The flexibility for sure! Also, I love that I can take what I learn each semester and put it to use at work. First semester was my favorite, because I learned about the seven dimensions of wellness and behavior change models, which opened up my eyes to my own health and habits. I like getting to know other students in the program through discussions and group projects. Online courses can be hard, because you feel alone at times—it’s just you and your laptop. Forming online friendships with other classmates is essential to bounce things off of and to support each other on this journey. What advice do you have for other students? You need good time management skills. Being organized with your assignments and giving yourself ample time to complete them is very important, as they can take longer than expected. Make sure you have a great support system in place; my husband and daughters are amazingly supportive. This is a lot to take on. You and the significant others in your life need to understand the time commitment and that it may take you away from them for periods of time. With that being said, it is never too late to get your degree! I was 30 years old with a two-year-old the first time I went back to school. Now at age 50 and with a teenager still living at home, I am completing my bachelor’s degree. It can be done, just believe in yourself and never give up! Take the next step your toward your dream job in health and wellness. Visit the UW Bachelor of Science in Health and Wellness Management website to find out why this program is great for busy adults. Or talk with a friendly enrollment adviser today by calling 1-877-895-3276 or emailing learn@uwex.edu.